Have you ever believed God had made you sick to teach you a lesson? Do you believe God wants some to be sick but others to be well for a divine purpose known only to Himself? Have you struggled with a healing in your body or spirit but it seemed as though God just doesn't want to answer your prayers for healing? Do you believe you've got a thorn in the flesh God is using to refine your character? 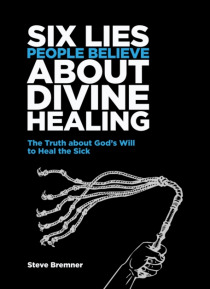 … These are lies, and Steve Bremner Scripturally and carefully answers these objections to healing along with other misconceptions that many Christians believe when it comes to divine healing. This book will help you destroy the traditions of man and lies of religion that nullify the power of God in your life! What we believe about God and how He works can have a dramatic impact on how we approach Him and what we expect of Him. Many Christians believe lies about The Father that keep them bound and prevent healing in their bodies and in their lives. In this easy-to-read book you'll learn what some of the top lies are that hold Christians and unbelievers back when it comes to divine healing. You too can receive healing and heal the sick. Quit believing lies today. God is not just "e;able"e; to heal, He is willing!